Different herbal traditions use the buckthorn as stimulating laxatives. 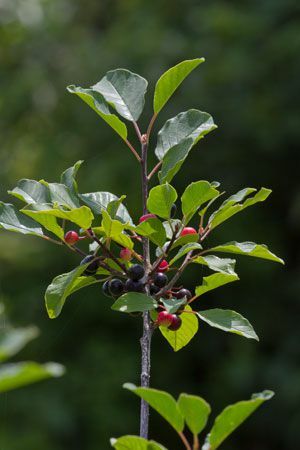 Alder Buckthorn (Rhamnus frangula) and Common Buckthorn (Rhamnus cathartica) originate in Europe but now grow wild in North America. Cascara buckthorn's (Rhamnus purshiana) native range spreads from western Canada to northern California. The bark of these shrubs contains anthraquinone glycosides. Gut bacteria activate these compounds in the large colon. The free anthraquinones inhibit the absorption of electrolytes in the colon thus causing an influx of water into the lumen of the bowel and promoting peristalsis. Anthraquinone containing herbs typically produce a bowel movement within 6-8 hours of taking them. The different species of buckthorn and also other anthraquinone containing laxatives (senna, aloe resin, and rhubarb) produce virtually the same effects in the body. No major difference exists. Avoid using the fresh bark of buckthorn because it causes nausea, severe cramping pains, and catharsis. Drying and storing the bark for a year reduces its acridity and makes the preparation suitable for medicine.